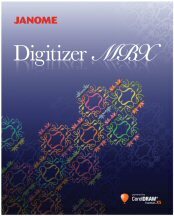 Everyone who purchases either Janome Digitizer Jr. or Janome Digitizer MBX from us receives a free class for a basic introduction to the software. You will be shown how to navigate through the software program. Digitizer owners meet monthly in Dover, led by Steven Haber (with assistance from Lois Williams). We go beyond some of the basic tutorials and projects that Janome offers, finding unique ways to use the tools available to us to produce some amazing designs. These classes are designed to supplement what you'll learn when you take the basic training sessions included with your purchase of Digitizer. We try to avoid just lectures, and have exercises that we can all participate in. Bring your laptop with Digitizer installed and your Digitizer dongle! If you're a digitizer owner and aren't on our regular mailing list, contact the store or Steven at sc_haber@verizon.net to be added to our list. We generally try to meet the fourth Saturday of each month at 11:30 am, but get on our list because there are occasionally exceptions! All levels of expertise are welcome. A PC classroom is set up for each session with multiple monitors positioned so there are no bad seats. The fee for each session is $10. Steven is an experienced computer "geek" with a professional background in graphics, so discovering embroidery has an extension of some of what he has been doing in his "business" life for the last 35+ years!